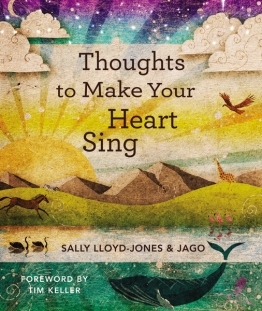 For Valentine’s Day this year, I purchased “Thoughts to Make Your Heart Sing” by Sally Lloyd-Jones to give to my son. If the name Sally Lloyd-Jones sounds familiar, it’s because she is the author of “The Jesus Storybook Bible” which is hands down one of the best items on the market for shepherding young children. When I learned Sally had developed a “devotional” book for young ones, I couldn’t wait to get my hands on it. We’ve been using this book since February 14th, and I’m so impressed with it. The devotions are short and sweet (one page each), and perfectly written for a young audience. Each devotion includes a Bible verse (and of course the devotion incorporates and/or explains the Bible verse). The illustrations are vibrant and beautiful – in fact, I even prefer them to the “Jesus Storybook Bible” illustrations (even though the same artist – Jago – illustrated them both, they are quite different). “Why has so little attention ever been given to the devotional lives of children? Of course we should be doing all the standard things: teaching them the catechism, including them in family devotions, helping them participate in worship. But encouraging a child to develop his or her own devotional life has long been a missing piece that has direct effect on whether a child grows up with a balanced spiritual life or one that is dangerously one-sided. By that I mean that it is all too easy to concentrate on data-transmission to our children. Of course, laying down a foundation of biblical truths, Biblical memorization, and doctrinal basics is very important. Somehow, however, the experiential side of a relationship with God is often neglected, so that by the time children are teens, they are woefully lopsided – long on information, but short on experience of God’s presence. Why not look into it today?